Stomach bloating, also known as abdominal bloating, is a condition characterized by abnormal sensations of fullness or tightness in your stomach or abdomen. This condition has a number of potential causes, including weight gain, constipation, overeating and unconscious or habitual swallowing of air. Peppermint tea has properties that may help relieve bloating symptoms. Consult your doctor before you take peppermint tea. In addition to abdominal tightness or fullness, some people with stomach bloating develop visible abdominal swelling called "distension." Other common causes of the condition include food intolerances like lactose intolerance, bacterial overgrowth in your small intestine, irritable bowel syndrome and gastroesophageal reflux. You can develop a worsening of your symptoms if you eat foods such as beans, cabbage, lentils, turnips or Brussels sprouts. More medically significant potential sources of bloating include celiac disease, lack of digestive enzyme production in your pancreas gland, buildup of an alcoholism-related fluid called ascites and ovarian cancer. Peppermint tea is made with dried leaves of the plant Mentha piperita. This plant was originally found in all continents except North America but now has spread widely throughout wet, temperate regions of this continent, as well. Peppermint tea and all other peppermint preparations contain an oil called menthol as their active ingredient. According to the University of Maryland Medical Center, or UMMC, a typical adult dose of tea is 1 teaspoon of dried leaves steeped in 1 cup of boiling water for 10 minutes. In most cases, you can take multiple doses between meals without harming your health. Menthol oil relieves spasms in smooth muscle tissue, Drugs.com explains, and peppermint tea achieves its bloating-related benefits by relaxing your muscles and allowing you to release any pent up gas or flatulence. Brigham and Women's Hospital classifies peppermint tea as a natural remedy for bloating and gas and notes that evidence for the effectiveness of some natural remedies relies largely on anecdotal accounts, not scientific study. In addition to peppermint tea, potential natural remedies for bloating and gas include chamomile tea, caraway, turmeric, anise, coriander and fennel. 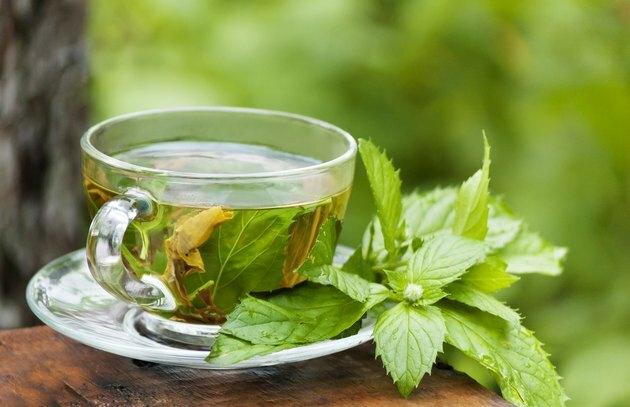 Peppermint tea can potentially produce a burning sensation inside the mouth and should not be given to small children or infants, the UMMC notes. Avoid the use of any other form of peppermint in infants and small children as well. Adults need to avoid using peppermint tea if they have a hiatal hernia or a condition called gastroesophageal reflux disease, or GERD. Brigham and Women's Hospital recommends you speak with your doctor before you try any natural remedy for gas or bloating, not just peppermint tea. Which Teas Are Good for Digestion?